Over the course of my research into live music, the phrase I’ve probably heard the most is ‘You can’t beat live music’. Another phrase often repeated more generally is how the pictures are better on radio. Last night I was lucky enough to actually be at Ronnie Scott’s Jazz on 3 on Friday 13th November rather than having to create my own pictures, broadcast live on Jazz on (Radio) 3, BBC Music Jazz, and Jazz FM, and presented by Jez Nelson. The first band on was the wonderfully energetic Vula Viel, with two drummers, sax, keyboard and the pogo-ing lead on the gyll, a type of West African marimba. At one point, the gyll player, Bex, talked about how she’d spent three years learning how to make the instrument and gave a live on air demonstration of how to tune the “keys”. She first struck a piece of wood about a foot long with a beater and produced a lovely woody tone. At this point, she produced a very sharp looking adze (axe), got down on the floor and started hacking away at the key, first one side, then the other. She then played the key to show how the pitch had got higher through thinning the wood. I would imagine that all that was heard on the radio was the sound of banging and the subsequent tone, albeit explained helpfully by Jez Nelson, but a lot more fun to watch. The second “behind the scenes” bit of fun came with Jarrod Lawson’s set opening. The four piece band started with Jarred on electric piano and vocals, with drums, bass and guitar accompanying. Only Jarred’s vocal microphone decided not to play ball and ended up pointing south, directly at the floor. The band played on while Jarred first tried to fix it himself, but he was eventually rescued by a BBC radio bod who ran on with a new mic stand, after which Jarred finally launched into the start of the song. Jarred remained admirably calm and smiling throughout and I’m sure that anyone listening would have been none the wiser to what was a slightly nail-biting moment, although it would have been interesting to listen to and see whether it seemed like an unusually long introduction! 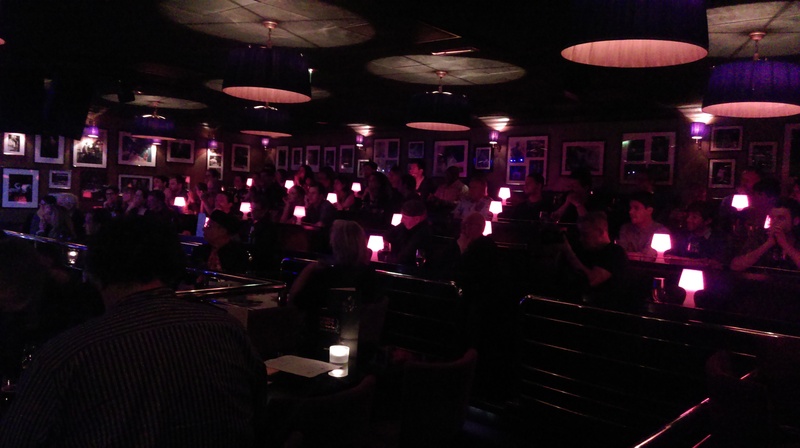 It was a real treat to be there, not just to be in Ronnie Scott’s and listening to exciting new music, but also to see the inner workings of a live radio show. Bearing in mind just how much music on radio was live rather than recorded in the early half of the 20th-century, it is a shame that we do not also have the visual record of such shows, in order to be able to fully understand what were live shows in their own right (perhaps this is the case with all live recordings, however!). Of course, with BBC radio these days, it is easy to watch the presenters and players as they are on air, as the boundaries between media – radio, TV, online – grow ever more blurred. With old recordings, the pictures in our head will have to suffice. To listen to both performances from Ronnie Scott’s, listen here.